Prepare at least 2 smears per patient! Place a small drop of blood in the center of the pre-cleaned, labeled slide. Using the corner of another slide or an applicator stick, spread the drop in a circular pattern until it is the size of a dime (1.5 cm2).... 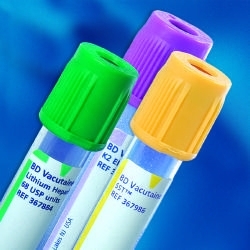 Prepare a working fixative solution for 10mL of blood sample by adding the entire contents of Tube B into Tube A. Mix the solution GENTLY by inversion. Allow the solution to stand at room temperature for 15 minutes to activate. once activated, the solution must be used within 24 hours.